The Summers-Knoll Elementary School is again selling "Nikola Tesla" T-shirts. I've purchased one and love it !!! 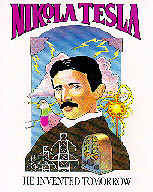 Funds raised from shirt sales are used to continue their 19-year crusade promoting Nikola Tesla. To date their accomplishments include placing bronze busts of Tesla at Harvard, Yale, Princeton, MIT, Caltech, Univ. of Michigan, Univ. of Wisconsin, Univ. of Maryland, and Purdue.